Ugh! 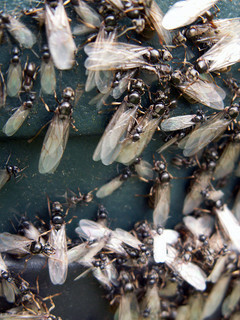 Fascinating stuff, but I loathe ‘flying-ant night’ every Summer. They were all over my doorstep last night and my Aunt had an infestation in her guest bedroom a little while ago (she thinks they were in the house walls and came out the wrong side – indoors instead of out) – eek! eek is right Sadhbh, the don’t actually do us any harm but I don’t think I’d like a big swarm in my house!